In a few days, residents of Mississippi, Tennessee and Georgia have the chance to do back to school tax free shopping and, in many cases, no local sales taxes. Illinois Tax Free Weekend 2017 will not happen once again this year. Illinois residents won’t have that option. Illinois had a summer sales tax holiday in 2010. But it hasn’t had one since and isn’t among the nearly 20 states offering them this season. “The General Assembly would have to pass legislation to put a back-to-school sales tax holiday in place,” Terry Horstman, spokesperson for the Illinois Department of Revenue, said. In most states, the holiday must be approved annually, and practices can vary state to state on whether just state or state and local taxes are suspended. Illinois will be one of many states with no 2017 Sales Tax Holiday. We will update this page if anything changes for Illinois. 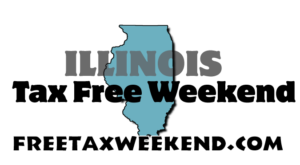 This will be the sixth consecutive year for No IL Tax Free Weekend.